Many who knew her considered Anna Airy one of the most gifted English women artists. She was a prolific painter and mastered a variety of mediums including oil, watercolor and etching. Her choice of subject matter was as diverse as her mediums, and she was held in high regard for this eclecticism. The Royal Society of British Artists held a ‘jubilee’ exhibition honoring her great talent, entitled Anna Airy: Paintings, Drawings and Prints in 1952. Martin Hardie, the author of the forward, acknowledged the diversity of style and technique she employed: … an artist of infinite variety in her choice of diverse themes and manifold methods. She has ranged from delicate intricacy of line with etching needle and pen-and-ink to summary breadth of bold impressionism in oil, watercolour and pastel. Airy was born in Greenwich on June 6, 1882 and was the granddaughter of Sir George Biddle Airy, K.C.B., Astronomer Royal. She began her artistic studies at the Slade School; where she trained from 1899 - 1903. While there she studied with Fred Brown, Wilson Steer, Henry Tonks and Sir W. Russell. Airy not only won the Melville Nettleship Prize in 1900, 1901 and 1902, but also won all the prizes at the Slade School including the Slade School Scholarship in 1902. In 1905, while living at 7 The Studio, Sherriff Road, West Hampstead, Airy made her debut at the Royal Academy with her painting Michael Lee Esq. : Indian Mutiny and would continue to exhibit there until her death; displaying more than 80 works in all. During this period Anna met and married Geoffrey Buckingham Pocock, a well-known painter and teacher of etchings, and the two of them were sharing a studio at 5 Parkhill Road Studios, Haverstock Hill by 1908. In 1906 she was elected a member of the pastel Society and her first one-woman exhibition was held at the Carfax Gallery in 1908; the same year she was elected to the Royal Society of Painters and Etchers. In 1909 she became a member of the Royal institute of Oil Painters; in 1918 was elected to the Royal Institute of Painters in Watercolours and in 1945 became President of the Ipswich Art Society. Through all her successful art endeavors, she remained a purist, allowing the natural line and curves of flowers, ferns and fruits to shape her perspective. In an article, Drawings by Anna Airy, International Studio 55, March – June 1915, p. 189, the writer describes Airy’s motivation for drawing branches exactly as she sees them: …the upper branches are so varied, inventive, and graceful, that the least alteration of them, even the measure of a hair’s-breadth, spoils them … as the real branches are copied, the hand libels their lovely curvatures even in its best attempt. Several of her paintings have been reproduced in International Studio, Colour, and a number of newspapers and magazines. She was also the author of two books: The Art of Pastel and Making a Start in Art. 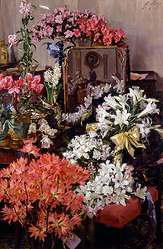 Within the United Kingdom, Anna Airy exhibited at the Baillie Gallery; Carfax and Company Gallery; Fine Art Society; Glasgow Institute; Goupil Gallery; International Society; Walker Art Gallery; London Salon; Manchester City Art Gallery; New English Art Club; Royal Academy; Royal Society of Portrait Painters; Royal institute of Painters in Watercolours; and the Royal Institute of Oil Painters. Internationally she exhibited her works in Canada, France, Italy, New Zealand, Sweden and the United States. Works by Airy are in the collections of H.M. the Queen; British Museum; Victoria and Albert Museum; Imperial War Museum; National Gallery of New South Wales; Leeds City Art Gallery; Huddersfeild Art Gallery and Doncaster Corp. Art Gallery.